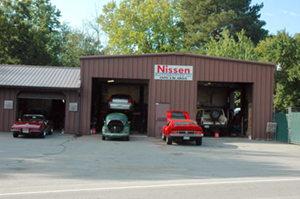 Nissen Automotive, Inc. is a complete automotive repair center. Robert Nissen, the owner, has been performing high quality automotive repairs since 1979. Robert is an ASE Certified Master Automobile technician with over 30 years of professional repair experience and 20 of those years as a Master Technician. He knows his way around a car, any car, and that means yours too. We are conveniently located in Angier, NC on NC 210 West for your automotive service, repair, and maintenance needs. We are qualified to repair and service all domestic and imported vehicles. We are highly trained and have access to the most current diagnostic information. When necessary, we buy access from Vehicle Manufacturer Diagnostic websites to allow us the most up to date, accurate, and specific information to repair your modern complex vehicle, whatever brand. We use high quality parts and back our work with a 12 month/12,000 mile warranty. We believe that quality is more important than a low price, but we try to provide both. We have suppliers that offer original equipment manufacturer (OEM) quality components at reduced prices. Most local parts suppliers don't stock the best parts. Sometimes you must wait a little longer for them, (a day or so) but the difference shows in how much longer the better parts last. An extra day or two can equal years of continued service. 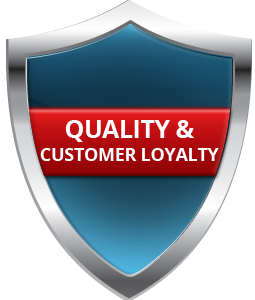 Longer lasting repairs are not in our best interest from a profitability standpoint, but your continued patronage and loyalty ARE! Unless you have your car for eight years or more, we don't expect to perform the same repair twice. A timing belt and water pump replacement should last as long, after we've performed it, as it did the first time. That's Quality! We are a cost-effective alternative to dealership servicing. Under Federal law, your new car warranty will still be valid/in-effect if we perform your factory recommended services (per: Federal Right to Repair Act). American, Asian or European, we are qualified and knowledgeable about your vehicle whether it be a car, SUV or Truck. We also perform Fleet maintenance services. If you have several vehicles or 100 we can service them and keep up with their maintenance intervals; based on mileage per year. The longer we work with your vehicles, the more accurate those intervals will get. If you don't have a fleet manager, let us handle that for you. We can tell you when to bring your vehicles in for oil changes or other required regular or seasonal maintenance. We'll save you money by advising you of problems in advance, before they cause a failure or time-loss breakdown. 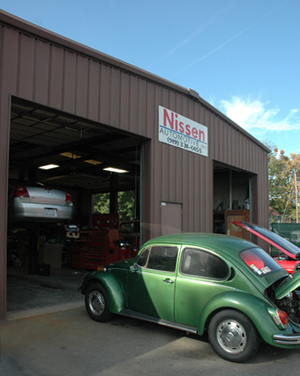 Nissen Automotive's mission is to provide the best customer service and highest quality work possible. Our customers are our purpose for coming to work each day. While we do work on cars, it is our customers whom we work for. We strive to improve our accuracy, efficiency and knowledge. While we do seek to make a profit, it is our intention to use most of that gain to add more and better equipment, more training, added service capabilities, improved management techniques, and better pay and benefits for our employees so that they are happier, less stressed, and capable of their very best work.